NASSAU, The Bahamas - Minister of the Environment and Housing the Hon. 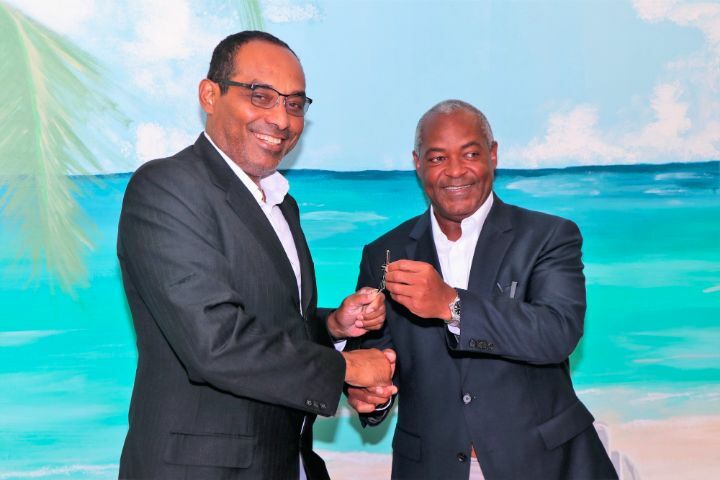 Romauld Ferreira handed over the ceremonial key to Chairman Kenwood Kerr to launch the New Providence Ecology Park (NPEP) -- the $45 million redevelopment of the New Providence Sanitary Landfill -- on April 12, 2019. "Today is indeed a very happy and proud moment in the life of the Ministry of the Environment and Housing," Minister Ferreira said during the Official Handover and Dedication Ceremony, held on the site. 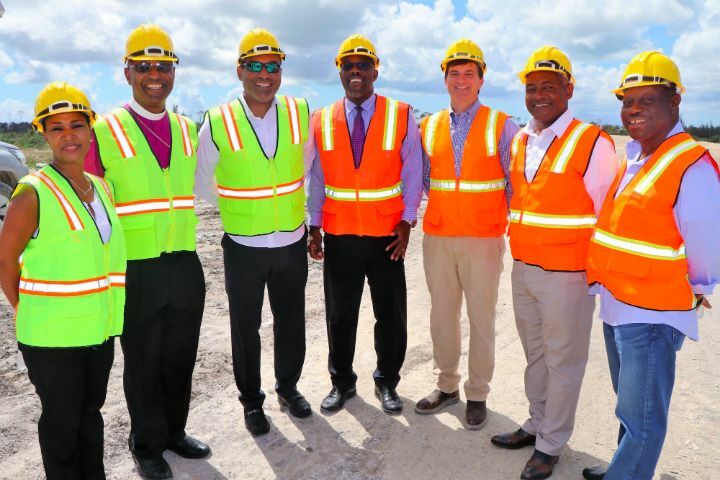 "We are very pleased to have finally arrived at this moment, where the New Providence Sanitary Landfill is in the hands of a private entity, in cooperation with the government". "This was a major plank in the government's thrust to responsible waste management," he added. Among those present at the ceremony were Permanent Secretary Janice Miller, Undersecretary Reginald Saunders, Director of Environmental Health Services Melanie McKenzie and Senior Deputy Director Thomasina Wilson, Member of Parliament for Tall Pines and Deputy Speaker of the House of Assembly Donald Saunders, Government officials, NPEP board members, employees and various stakeholders. Bishop of The Anglican Diocese of the Bahamas and The Turks and Caicos Islands The Rt. Rev'd Laish Zane Boyd, Sr., performed the Prayer of Dedication. Afterwards, those in attendance went on a brief tour of the site. "I want you to understand and appreciate that, where we stand now is approximately in the centre of New Providence; and so, this site has the potential to positively or negatively [affect] every single person on New Providence, residents and visitors alike," he said. "What is happening today is about human well being," he added. According to NPEP -- which is jointly Waste Resources Development Group and Providence Advisors, Limited -- the New Providence Ecology Park is replacing the current New Providence Sanitary Landfill with "a purposefully engineered landfill and material recovery facility with proper operational oversight, a best in class solid waste management system, significant recycling of the waste stream, controlled access and the containment of environmental and health hazards". Of note, NPEP added, will be the green space proposals -- a multi-phased initiative -- that will take place within a 10-year period, inclusive of the eventual recreational green spaces and walking / jogging paths. NPEP pointed out that it is projected the facility will have 'best operational practices a convenient residential drop-off site, a new recycling facility, composting facility, groundwater monitoring wells, enhanced access roads and security fencing'. "I congratulate the new board and I wish them every success and Godspeed in this endeavor," Minister Ferreira said.